As part of the annual Celebrate Canada! (http://www.pch.gc.ca/Canada/) (SdJotD 010702) festivities, the Celebrate Canada Committees choose poster designs from school children in Canada's provinces and territories. The theme for 2002 was A Celebration of "Canadian Firsts". Celebrate Canada! runs from June 21st, National Aboriginal Day to July 1st, Canada Day. These pages at the Canadian Heritage - Patrimoine canadien (http://www.pch.gc.ca/) site show the winning poster designs and provide information about the individuals who created the entries. Details of the 2003 edition of the Canada Day Poster Challenge will be announced later this year at the site as well. Also be sure to see the Web site of the Prime Minister of Canada / Site web du Premier ministre du Canada (http://www.pm.gc.ca/), in particular Prime Minister Jean Chrétien's Canada Day Address. SilverKeeper is a very handy Freeware backup utility from LaCie, Ltd. (http://www.lacie.com/). LaCie, Ltd. manufactures hard drives  very fast and large hard drives. SilverKeeper is for use with all sorts of drives with IDE, ATAPI, SCSI, USB, or Firewire interfaces on Macintosh computers and requires OS X 10.1.2 or OS 9.0.4 or later and CarbonLib 1.5 (http://www.info.apple.com/kbnum/n120047). What is not required to use the Freeware utility is a hard drive from LaCie, Ltd. A very nice touch on the part of the company to offer up such a thing. Again, Mac only and with recent operating systems. SilverKeeper  it's free with registration and it works well, especially with one of those sporty new LaCie, Ltd. drives. There has been a recent interest in Popular music for Swing  large bands bordering on orchestras playing numbers first performed fifty and sixty years ago, or at the very least influenced by those early recordings. Acting as a sort of bridge between Jazz of the twenties and thirties and Rock and Roll in the late fifties, Swing is the loose term used to describe Big Band material that was performed at a slightly faster tempo making it ideal for dancing. It helped to knock down certain racial barriers common in the record industry during the war years, at least with the record buying public. Recorded on ten inch records played back at 78 revolutions per minute audio fidelity was not a high point but the style worked perfectly within the three and a half minute time constraint associated with the playback medium. Recorded live, the energy level of many of these titles can be attributed to the arrangements and production challenges of recording such large outfits. Many of these records will hopefully be rediscovered by fans of this "new" form. I can clearly remember the summer when about six kids, myself included, would take turns holding on to the inside of one of those rigid metal garage doors. A few of the kids would also take turns throwing the door open from the outside without any warning or countdown for who ever's turn it was. Sure it was dangerous but it was a whole lot of fun until one of us got hurt. It turns out that the brackets holding the tracks to the wall aren't engineered for the added weight of children. We weren't nearly as surprised by this failure as the neighbor kid who quickly became part of a garage door, snow tire and rake sandwich. As one would imagine, his dad was fit to be tied that weekend putting up the new door. Triple J (http://www.abc.net.au/triplej/) is a radio network for the youth of Australia. A radio station serving a growing list of urban and rural communities around Australia and sending programming out over the wire for the world to enjoy. Content usually averages about 25-30% Australian. Programming at the network has a lot of features, live music fans will dig Live At The Wireless (http://www.abc.net.au/triplej/latw/default.htm) while Roy Slaven and HG Nelson are Gatorade-out-the-nose funny on Sundays with This Sporting Life (http://www.abc.net.au/triplej/program/sporting.htm). Check your local listings or do the math if you live in a place other than Australia and listen over the Internet. Folksong in the Classroom. This newsletter published three times annually for a network of teachers of history, literature, music, and the humanities advocates using folk songs as primary source materials for studying our own and other cultures. Includes discussions, suggestions about classroom applications, news from teachers, supplementary materials, discographies, song sheets, etc. Available by subscription, P.O. Box 264, Holyoke, MA 01041, individuals $7; institutions $12. Traditions. A new semiannual folklore journal that documents and promotes West Virginia's rich mountain heritage. The journal was developed as a direct result of the 1992 West Virginia Humanities Council's Summer Seminar for Teachers held at Fairmont State College. It is especially designed to appeal to K- 12 teachers. Available by subscription from Traditions, Fairmont State College, 1201 Locust Ave., Fairmont, WV 26554, $6. Taylor, David. Documenting Maritime Folklife: An Introductory Guide. Washington, DC: American Folklife Center, Library of Congress, 1993. (Also available through the Superintendent of Documents, U.S. Government Printing Office S/N 030-000-00236-9). One of things I most enjoy about writing Site du Jour of the Day are the site suggestions that regularly come in from about a dozen of readers. These suggestions help keep the project fresh by taking it in a direction it might not have otherwise gone. During the next week or so, Site du Jour of the Day episodes will look at sites suggested by Site du Jour of the Day readers. Or as they are sometimes referred to  Site Scouts. This series of sites, suggested by Reddog feature historical and current information about The Navajo Code Talkers. These Native Americans played a crucial role for the United States during the Second World War. By sending and receiving messages in the Navajo language, the transmissions were almost guaranteed secure. Reddog again, this time with a site that not only identifies and gives a brief history of the Tyler Davidson Fountain in downtown Cincinnati, Ohio the one seen in the opening of the show WKRP In Cincinnati, but goes on to name Oswald Chesterfield Cobblepot as the Penguin from the Batman show, and lists both addresses for Fred G. and son Lamont Sanford. In the Addresses & Phone Numbers section  9114 South Central and 4707 South Central Avenue, Los Angeles, California. The first Site du Jour of the Day reader to achieve the designation of Site Scout, Basil Stetson has made a number of great finds. Added to the list is the site for Alligator Records. Home to what is probably the best roster of contemporary Blues artists on the planet, Alligator Records is what many believe a label should be. As Basil wrote, " I got turned on to Alligator Records when I found the 20th Anniversary (1971-1991) CD set at a friend's house. It is a rockin' set of Blues tunes. Alligator is a pure blues label started on a shoestring in 1971. The original goal was to promote unknown Chicago blues artists. The company has met with great success over time and features some of today's greatest Blues players." (020721) Filmmusic-Composers ...and we still like them! Site du Jour of the Day reader Kevin Clarke (Inconstant Moon: multimedia tours of the lunar surface (http://www.inconstantmoon.com/) (SdJotD 980630) (SdJotD 990720) (SdJotD 010531), PlanetFusion - your link to the world (http://www.planetfusion.co.uk/) (SdJotD 010815), and Selenographia - the Inconstant Moon Atlas (http://www.inconstantmoon.com/atlas.htm) (SdJotD 020227) writes, "Remember the movie 'The Right Stuff'? I always thought the main theme sounded a lot like part of Tchaikovsky's Violin Concerto, and I was not alone. Andreas Mettler has made a collection of discoveries like this at Filmmusic-Composers ...and we still like them! Some cases of 'inspiration' are more obvious than others, but some are breathtaking... erm... homages!" From Johnny Dixon who has suggested a number of sites that may have been missed all together by Site du Jour of the Day episodes  PopEx - Free music trading game (http://www.popex.com/) (SdJotD 000625) and Modern Living (http://www.hoogerbrugge.com/) (SdJotD 010207) to name a few, comes this charming time capsule of popular culture. The Langley Schools Music Project - ''Innocence And Despair'' is a series of sound recordings made during the 1976-77 school year by Hans Fenger and the students of Lochiel, South Carvolth, Glenwood, and Wix-Brown Elementary Schools at Langley, British Columbia, Canada. Originally intended for the students, teachers, and family members, two long-playing records were pressed of the recordings. Twenty five years later the material is available all cleaned up on the modern marvel known as the Compact Disc. It's a treat to get site suggestions from people who have had their own site featured as Site du Jour of the Day. The high quality of sites suggested by Kevin Clarke often share the enthusiasm and insight offered by Kevin's Inconstant Moon: multimedia tours of the lunar surface (http://www.inconstantmoon.com/) (SdJotD 980630), (SdJotD 990720), (SdJotD 010531), Selenographia - the Inconstant Moon Atlas (http://www.inconstantmoon.com/atlas.htm) (SdJotD 020227). One question I get asked a lot is whether, with something like the Hubble Space Telescope, it is possible to see the Apollo Lunar Modules and rovers on the Moon. The simple answer is 'no', but on his site Exploring the Apollo Landing Sites, budding astronaut Dan Durda gets close. He's assembled a collection of images from the Consolidated Lunar Atlas (the raw source for Selenographia), Lunar Orbiter and Apollo film archives, much of which is not available to the public, to produce sequences which zoom into each of the six Apollo landing sites. Be sure to check out the Apollo 17 site - where you can actually see the Lunar Module itself!" Similar in some ways to Brendan Powell Smith's The Brick Testament (http://www.thereverend.com/brick_testament/) (SdJotD 011204), Eric Harshbarger's LEGO pages show off creations in plastic and imagination. Suggested by Eric Goff who writes, "Here's a suggestion: The Lego Guy (Eric Harsbarger). He builds Lego sculptures as art and apparently (he claims) for a living. He has lots of pictures of his work, some of it is very detailed...". With the 2002 Minor League baseball season rounding into the last month or so, and the Major League season headed for a mid-September players strike there will be a lot of people spending recreation dollars at the movies again. Almost everybody has a favorite movie reviewer  no matter if it's a newspaper writer, host of a television show, or even some regular person who has an opinion that you trust. I've never been much good at recommending pictures to people, and I like it that way. The last two shows I've seen were Stuart Little 2, as sweet and entertaining as the first installment, however the inter-species romance was a bit disturbing but the voice talents of Melanie Griffith save the device. Star Wars: Episode II which is visually stunning from start to finish and the machines rock. Do not wait for the video or DVD release to see this one. On Monday I heard a sad story, an entertainer here in Lee County Florida is in the hospital with pneumonia. This individual is a clown, the birthday party/circus kind of clown. It seems that compounds in the makeup can lead to chronic pneumonia after being inhaled over time. With any luck, this clown will get better. Curious about the other dangers clowns might face, I happened upon this interesting piece which is a part of The Guide to Balloons and Ballooning (http://www.balloonhq.com/guide/) at Balloon HQ - Educating the World About Balloon Art (http://www.balloonhq.com/). According to this report, "There are a large variety of complications that can occur to the balloonist, including a collapsed lung, hemorrhoids, subconjuctival hemorrhage into the eye (usually not serious), and laryngoceles (outpouching of the larynx similar to what musicians get, like horn players)". Yikes! Sure, for those who have more apathy or tolerance that's easy for you to say, "Walk a mile in their shoes, they are only clowns". A lot of people are just plain wigged-out by clowns, and even for those of us who aren't, it seems a perfectly rational fear. 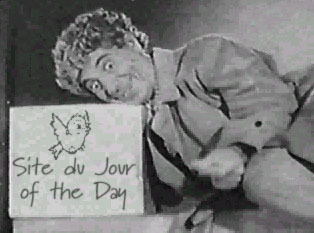 A Site du Jour of the Day reader who we'll call Juggling Jimbo wrote, "The occupational hazards of the pasty-faced smiling vicars of Satan make my day. Die, Clown, die!" Juggling Jimbo added, "However, I do appreciate a good balloon animal". Which is how the whole subject of clowns started  Balloon HQ presents: How Balloons Impact Health (http://www.balloonhq.com/guide/health.html) (SdJotD 020730). The No Clown Zone - ihateclowns.com is the perfect place for those individuals wishing to learn more about protecting themselves from the evil of clown. Tell your own why I dislike clowns story, and even sign up for the annual mime safari. The commercial aspect of the site has clothing available, the license plate frame that reads "Can't Sleep, Clowns Will Eat Me" is nothing short of wonderful. Secure a new e-mail address that tells the world how you feel about clowns, see the Scary Clown of the Day, and more. If you enjoyed visiting Creepy Clown's Gallery (http://www.creepyclown.com/) (SdJotD 001017), The No Clown Zone - ihateclowns.net will be just right.